When asked this month what they consider to be the most serious threat to achieving their household’s financial goals at this time, nearly three-in-ten Affluent respondents (27 percent) said “market conditions.” This is an increase of 10 percentage points from three months ago when this questions was last asked. Between Aug. 20 and September 4, there were eight so-called “all or nothing days,” reported Bespoke Investment Group. These are instances when at least 80 percent of the S&P 500 advances or declines. There have been just two other times since 1990 when there were as many all or nothing days in that short a period. On Aug, 24, the Dow, driven by concerns about China’s economic slowdown, suffered an historic 1,000-point decline before closing with a loss of nearly 600 points. It was the worst day for the Dow since August 2011. 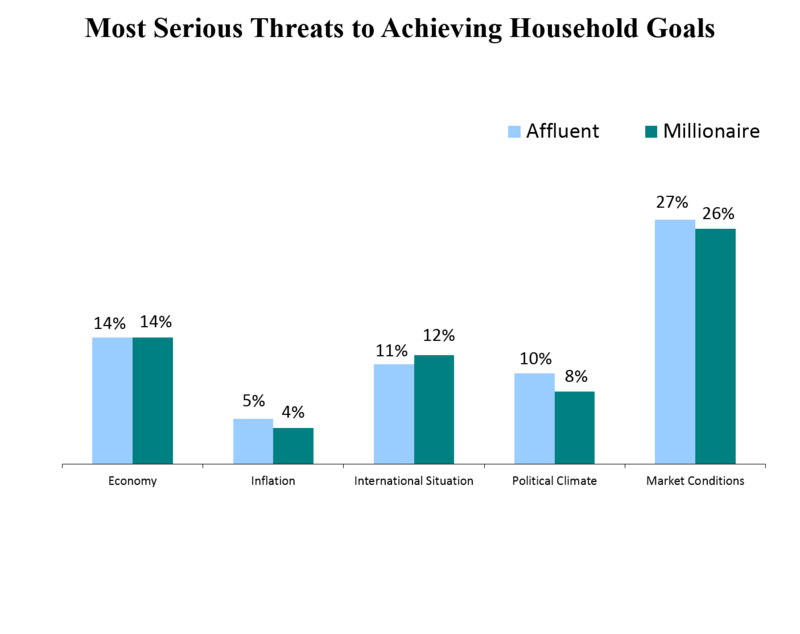 Beyond market conditions, Affluent investors surveyed by Spectrem Group indicated that the Economy (14 percent) and the International Situation (11 percent) were the most serious threats to achieving their household’s current financial goals. Ten percent cited the Political Climate, a drop from 14 percent three months ago, which might indicate a tuning out of the opening stages in the 2016 presidential campaign. Less than 10 percent said this month that they consider inflation to be the most serious threat to achieving their household’s current financial goals. That inflation is in check at 0.3 percent led in part to the Federal Reserve’s decision in September to keep interest rates at zero after months of speculation that the Fed would raise them for the first time since 2008.